In the Big Swamp, Race Just Seems To Adjust Itself. Since 1976, the U.S.A. has officially designated the month of February as Black History Month. It is an annual celebration of achievements by black Americans. In that light we publish this story relative to Black History at Bayou Pigeon. 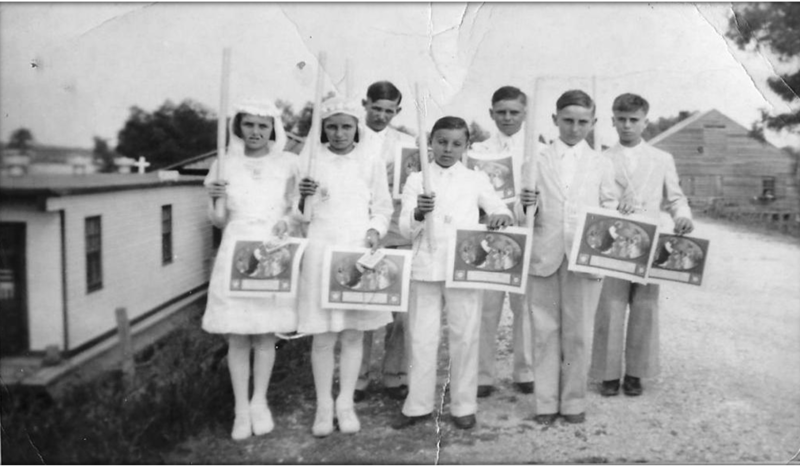 In the late 1930's, there was a small nucleus of Cajun families living at Bayou Pigeon. The town of Plaquemine was 25 miles away. Travel to Bayou Pigeon was mostly by water/ boat at that time and as far as most town folks thought Bayou Pigeon, was a semi-isolated community of levee dwellers who talked French and a little broken English. They eked out a living hunting and fishing and most did not have much if any formal education. Little did the people at Bayou Pigeon or the folks that lived in town realize that this was a blissful isolation. The Bayou Cajuns people lived a simple life; they grew, caught, trapped or killed their next meal. They sold what was extra when they could to earn a few dollars for other necessities. They were considered poor, but they had few prejudices, except maybe they did not trust government. No African Americans lived at Bayou Pigeon. Mr. Charlie Eads, Sr. operated this peddler service route for approximately two years, after which time he turned it over to one of his sons, Charlie Eads, Jr., affectionately nicknamed "Bully". Bully rode down the highway, stopping and blowing his truck horn at every five or six houses on the highway. Bayou Pigeon had one or two small grocery stores, but Bully offered milk, fresh vegetables, fruits, some staples, some fish, meat, sliced bread and ice, the most valuable commodity of all. The Eads family children would get up at 4 a.m. to pick the fresh vegetables and load Bully's truck for his daily delivery to Bayou Pigeon. At first, Bully served the community on the east side of Grand River. Co-author Adam Landry remembers he would get in his father’s pirogue and paddle across the river to the Hwy 75 road and purchase supplies from Bully. After the Bayou Pigeon Pontoon bridge was built in 1957, Bully would cross the bridge and deliver services to folks across the bayou and made crossing the river by boat to get to him no longer necessary. Bully always received a warm, “Bonjour, Comment Sa Va” welcome, because not only was he a source of goods not available in the community, but also he was a source of news and gossip and a link to the outside world for people who seldom strayed outside of Bayou Pigeon. Bully would also do special favors for his customers such as going to the post office in Plaquemine and bringing Money Orders to his customers in Bayou Pigeon. Bully was also a taxi service. 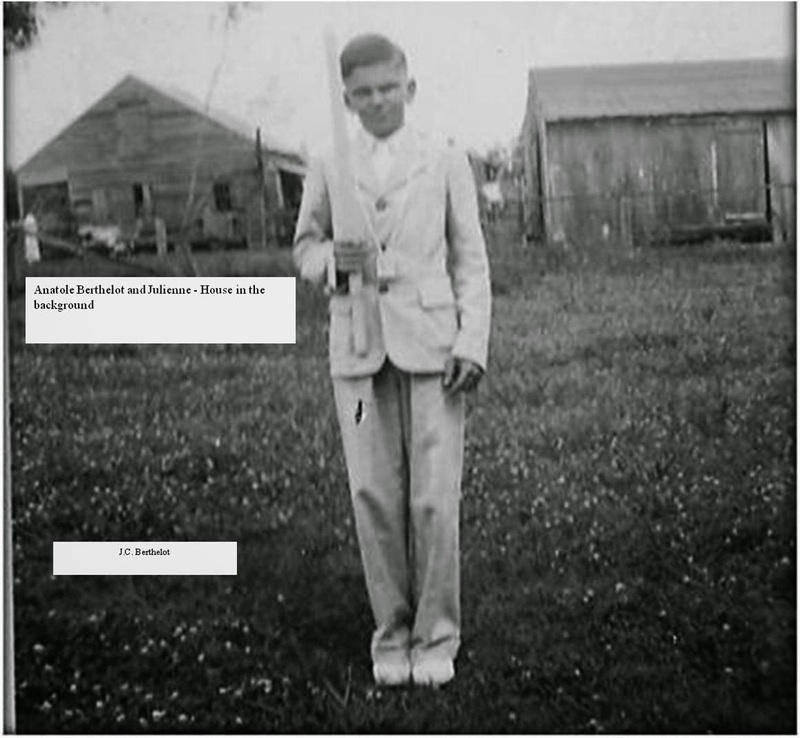 Mr. Curtiss Leonard, now of Morgan City, lived at Bayou Pigeon until the sixth grade, remembers Bully very well. He and his mother would catch a ride with Bully for one dollar, to Plaquemine. Bully dropped them off at Dalbors store for shopping and they would spend the night at the Lamar Hotel. Bully would pick them at the hotel the next morning and ride them back to Bayou Pigeon. Bully did this for many other folks who had no other transportation. All would ride in the front seat of Bully’s single cab pickup truck. In the 1950’s when many of the weekend campers began to arrive at Bayou Pigeon, Bully would stop in front of their camps as well. He had a sense of humor and was always smiling. In 1959, Bully had health issues that forced him to end his store-on-wheels route to Bayou Pigeon. Mr. Calvin LeBlanc, a lifelong Bayou Pigeon resident purchased the flat bed compartment from Bully’s truck (for $125) and transferred it to his pick-up truck. Calvin maintained the business that Bully had so successfully run for so many years, for two more years 1959 - 1960. During that time, the road from Bayou Sorrel to Bayou Pigeon was paved, making the trip to Bayou Plaquemine even more accessible and faster. But the future of the business route was sealed with the new paved road. Bayou Pigeon began a second period of Americanization, so to speak. With the new paved road and automobiles becoming affordable by almost everyone, people went to town every day. 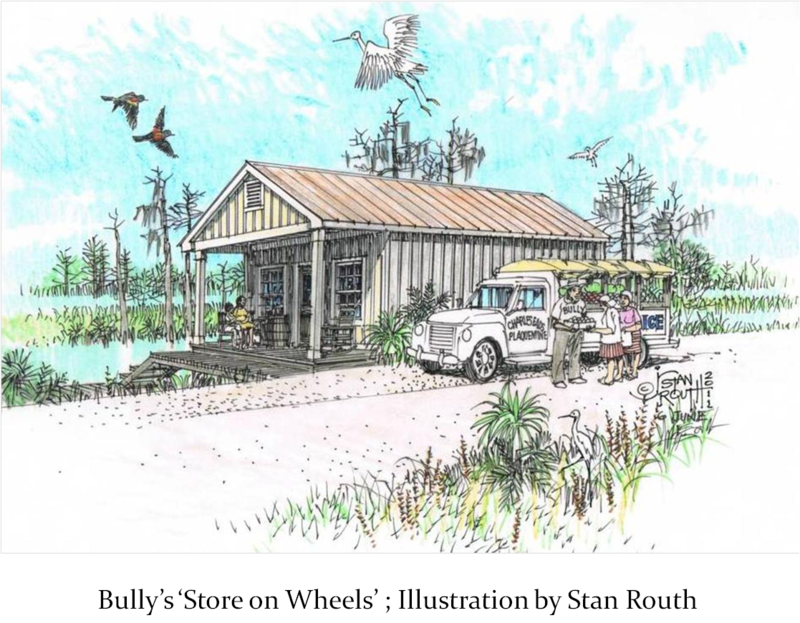 The store-on-wheels ended and became part of Bayou Pigeon history. Iberville Parish as well began to change in the 1960’s. Public schools were integrated and nationally the civil rights struggle reached high intensity. Looking back, Bayou Pigeon seemed to avoid a lot of the negative things about racial matters, and Charles “Bully” Eads had a lot to with that. Oh, there was always some modest negotiation, with selling goods, but there was never a feeling that someone had the upper hand because Bully was black. Bully had a great work ethic and personality He was known in the community as a trustworthy and reliable person. Race has always seemed to adjust itself in the big swamp, after all, who cares what race and or ethnicity you were when someone helps you grow, catch or kill your next meal? If you enjoyed this story, in the book on page 63, you can read another Black History interesting story, i.e. Susan Verami, one of the first documented full time residents of Bayou Pigeon, (Susan's Point 1843). She was a Free Woman of Color. 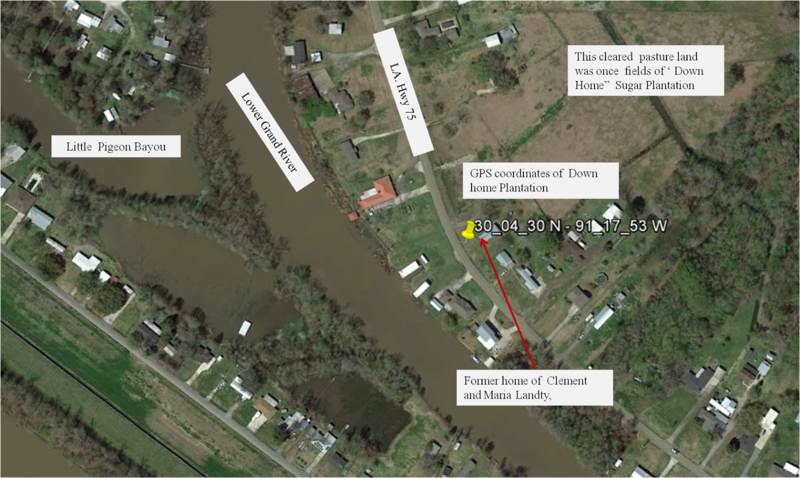 The purpose of this particular blog post is connect the dots on what eventually happened to the Antebellum homes of the Sugar Planters at Bayou Pigeon. The Civil War ended the Era of Agriculture at Bayou Pigeon. We have included a lot of data from our research because we believe it is important to be right. “In God We Trust’ all others bring data / pictures. The word Antebellum conjures up thoughts of Pre Civil War large Southern Cotton and Sugar Cane plantations, Black Slaves and palatial mansions. Bayou Pigeon nestled along the eastern side of the Atchafalaya Basin, in extreme lower part of Iberville parish, today it is known as a Cajun fishing community but its origins are Anglo-Americans Planters / Farmers from the New Iberia / Bayou Teche area. They came to build and operate Sugar Cane plantations in the late 1840’s. After the U.S. government surveyed the Atchafalaya Swamp in 1832 – 36, the federal government and the relatively new State of Louisiana opened the newly surveyed land for land grants and sale. 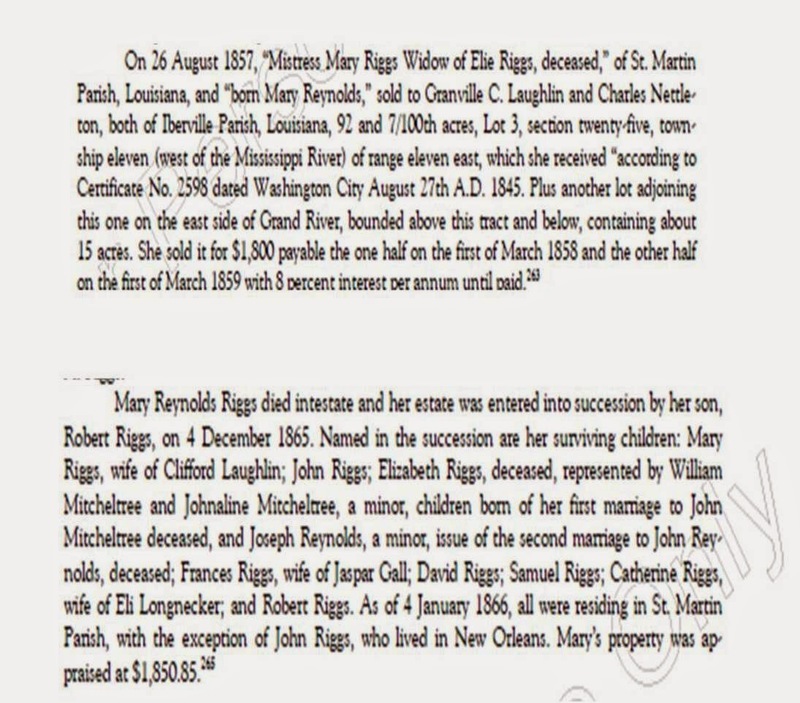 The Riggs Family who hail from Accomack, County Virginia and came to Louisiana in 1804, and invested in agriculture land on the western edge of the Atchafalaya Basin in the Bayou Teche / New Iberia area. These landowners were relatively wealthy, and were able to purchase this newly opened up land. By 1850 all the high ridges at the confluence of Pigeon Bayou and Grand River were bought up by the Riggs Family and their 'in laws'. 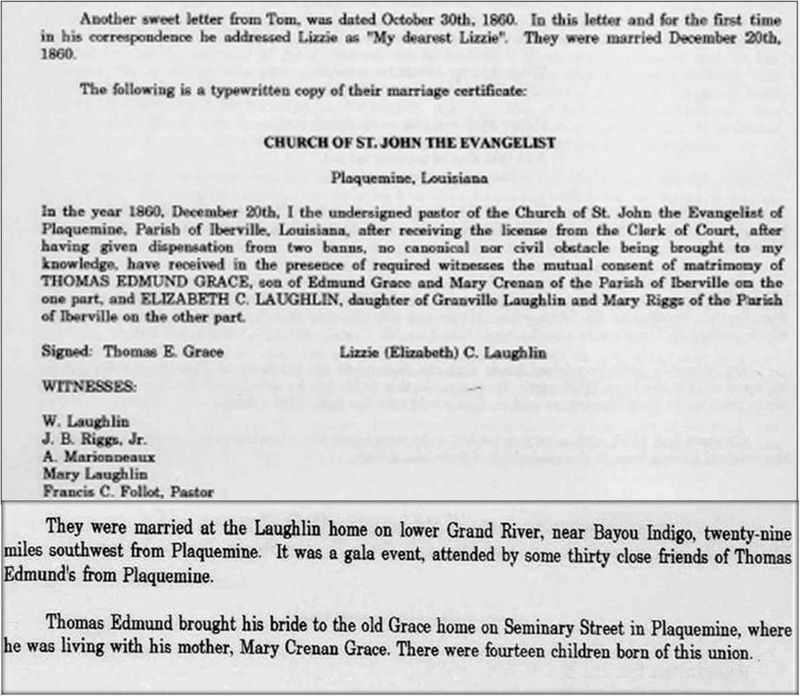 Objective Evidence by these excerpts from official parish conveyance records. It took 9 years, but The Riggs Family and their ‘in laws’ established sugar plantations and produced sugar by 1860. The George Mitchelltree family established their plantation by buying his brothers’ property at succession, (John Mitchelltree) in 1850. John Mitcheltree was married to Mary Philomena Riggs, thus he was part of the early Riggs family movement to the area. 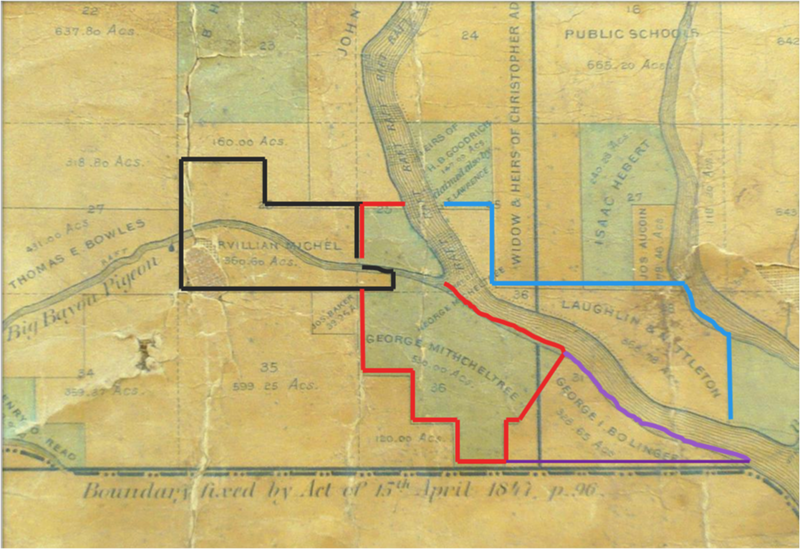 Opposite George Mitcheltree and on the east bank of Grand River was the plantation of Laughlin and Nettleton. G.C. 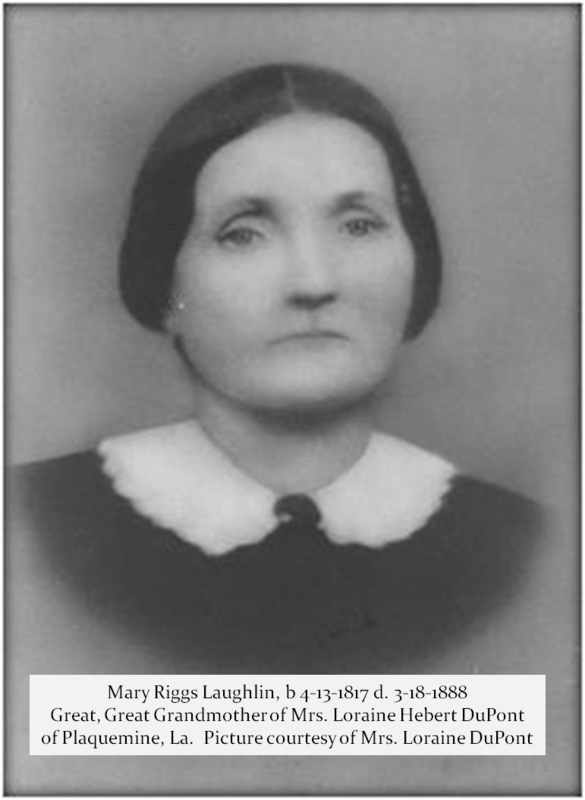 Laughlin married Mary Francis Riggs, daughter of Mary Reynolds Riggs. This plantation was established in the late 1840’s as well. 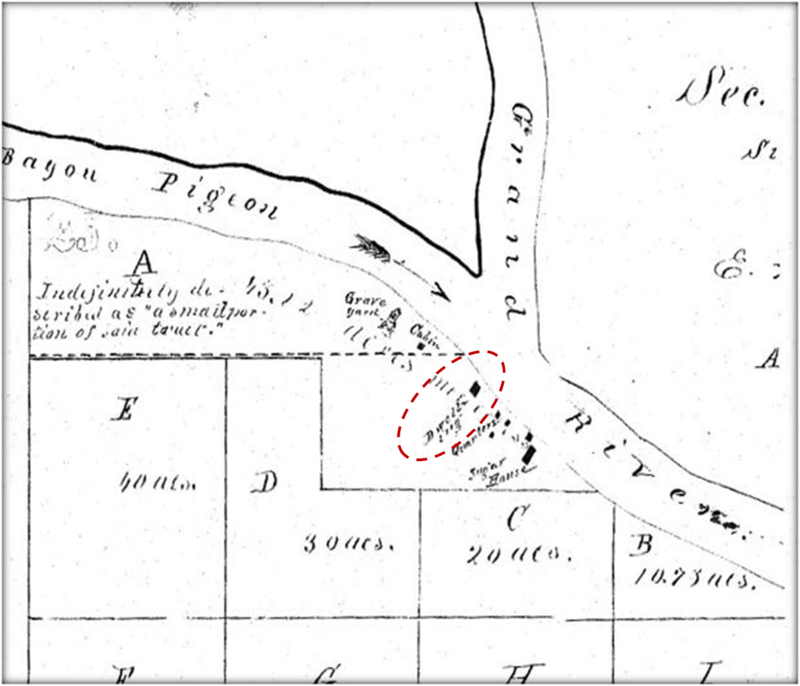 Adjacent to and below Mitcheltree on the west side of Grand River was the plantation of George Bollinger. Who bought his property from the John Mitchelltree succession as well. Bollinger was from Kentucky as Mitchelltree. Justillien Michel, the first Cajun at Bayou Pigeon established a plantation, by buying The Jasper Gall plantation, in 1858. Gall was married to Mary Frances Riggs. The Map below describes the location of the four sugar plantations at Bayou Pigeon / Grand River and the ownership in 1859. These were working sugar plantations with cultivated fields, black slaves, Sugar boiling houses, including plantation homes for the owner. As evidenced by the documents below, i.e., the succession of John Mitchelltree upon his death in 1850. Note: The succession clearly describes their was a main dwelling house on the property. Records from Iberville Parish Clerk of Courts office, document the disposition of the George Mitchelltree plantation after his death. The map below list the structures on the property when the plantation was sold at Sheriffs sale in 1875 after heirs of George Mitchelltree could not pay the taxes. The clearly show the location of the main / big house on the property. This document is truly one the priceless documents in the history of Bayou Pigeon. Ms. Clementine Berthelot Michel the second wife of Nestor Michel lived in the house until her death in 1947. 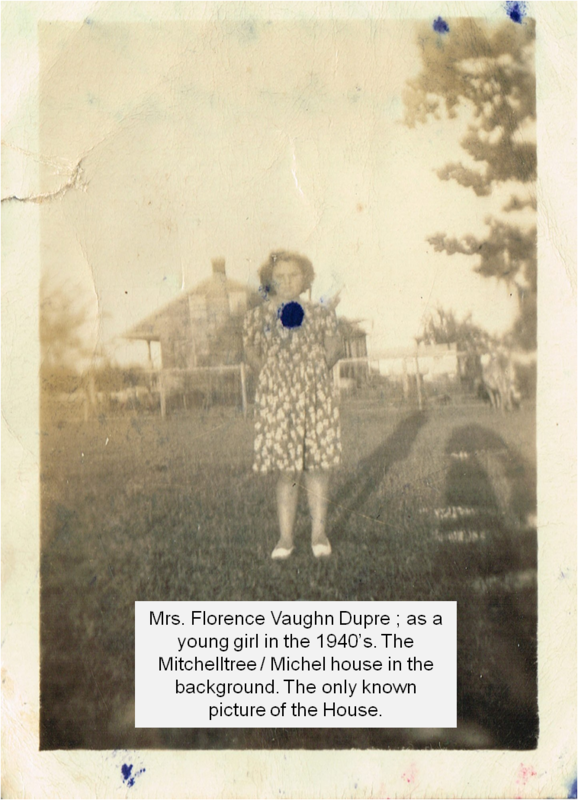 Ms. Joyce Percle daughter of Adeia Michel Percle, youngest daughter of Nestor and Clementine and Mr. Dealis Vaughn youngest son of Sidney Vaughn described the interior of the house. The house was torn down by Sidney Vaughn and Paul Michel in 1949. 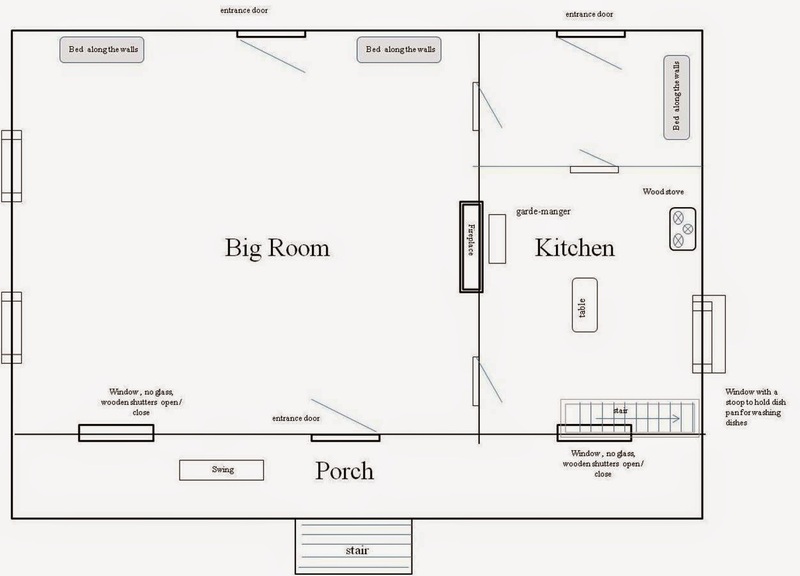 The sketch below provides the layout of the house as they remember it in 19 48 / 1950 time frame. The house would have approximately 100 years old. I am not sure if the origin of the house was known at the time the old house was torn down. We / I did not connect the dots on this one prior to the printing of the Bicentennial edition, i.e., The Laughlin _Nettleton / Berthelot Family connection. Granville Clifford Laughlin lived with his wife Mary Riggs Laughlin on their Down home plantation on east side of Grand River at its confluence with Lower Grand River. Granville passed in 1859 and left Mary with 11 kids and the “Down Home” plantation. The plantation had about 400 cleared acres, 10 slaves and was valued $28,000 in 1860. In 2013 dollars it would be somewhere between minimum of 809,000 and 10.7 mm. A young Lawyer from Plaquemine was hired to do the succession of Granville. He was Thomas E. Grace, in doing the succession he fell in love with Granville’s and Mary's daughter, Elizabeth Camilla Laughlin. He married her in 1860 at the Down Home plantation. 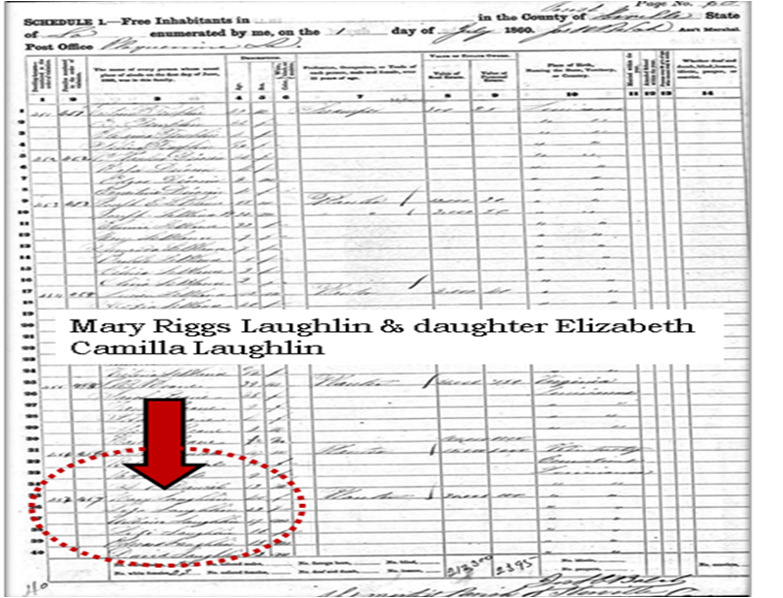 What happened to the Down home Plantation house that Lizzie Laughlin was married in? In 1915 - Anatole Berthelot of Bayou Pigeon purchased via Sheriffs sale the former property of William Hedges for $400.00. Anatole was encouraged into buying the property by Nestor Michel to buy after it had been available for a number of years. The purchased included all the buildings and other improvements on the property. It is safe to assume that one the buildings was the Down Home Big House. In the Background, is one of only two known pictures of the Berthelot house, circa 1930’s. 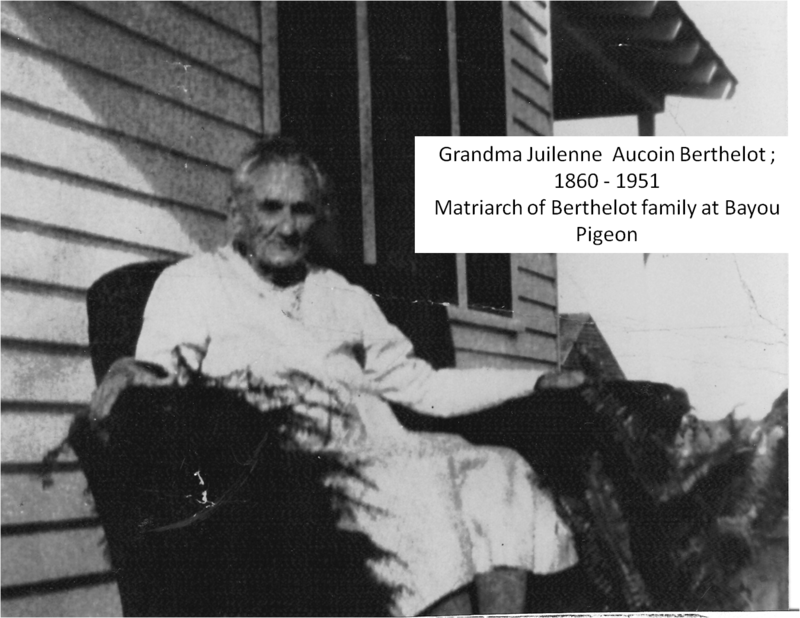 Grandma Julienne lived in the house until death. Look at it for a while… you are looking at the Laughlin down Home Plantation home built in the 1850’s. 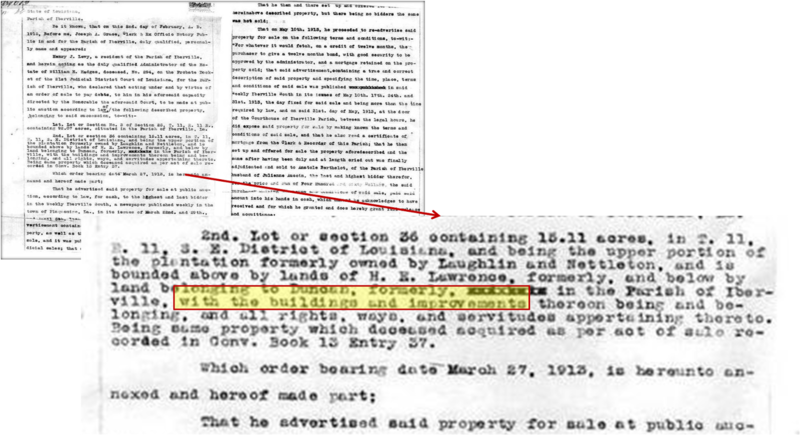 The 1913 conveyance where Anatole Berthelot bought this property insinuates that there was more than one building. Anatole‘s son Augustine, lived in a similar looking house a short distance away. Several of our reliable sources of information testified that the Augustine Berthelot house looked just like the Anatole Berthelot house. We (the authors assume this could be a second plantation dwelling. Where Mr. Nettleton, part owner and overseer of “Down Home” plantation lived. But we cannot find objective evidence to prove that, e.g., a picture. The Anatole / Grandma Julienne house was torn down by Clement Landry the son in law of Anatole Berthelot, in the 1950’s. Berthelot house, ie., Down Home Plantation. Note How close to the road and how high the back is off the ground. Suggesting that before the Borrow canal, the house was raised quite high off the ground. 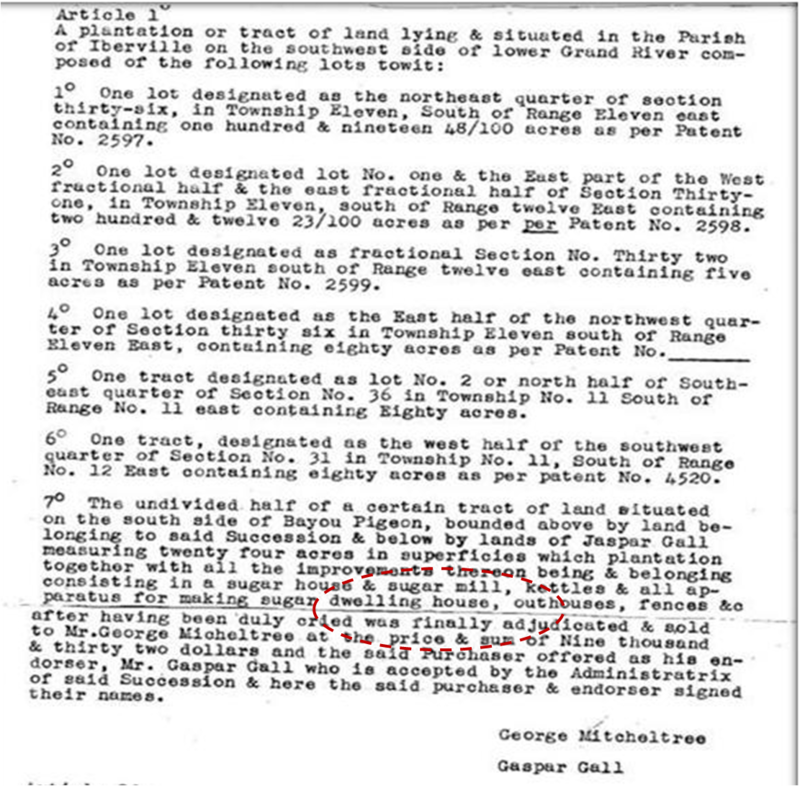 Even more difficult to connect the dots on…was finding out what happened to the George Bollinger Plantation located on the west side of Grand River… just below the Mitchelltree Plantation. The Bollinger Plantation was eventually purchased by Nestor Michel in 1917. Nestor sold it to Henry Dugas in 1929. Sometime after that Clebert Frioux, the son in law of Anatole Berthelot purchased part of the old Bollinger plantation, including the house on the property. Many folks testified that Clebert Frioux lived in a plantation looking house, facing the Grand River, just to name a few, they were Shirley Mae Settoon, J.C. Berthelot, Claude Landry, Eugene Vaughn. 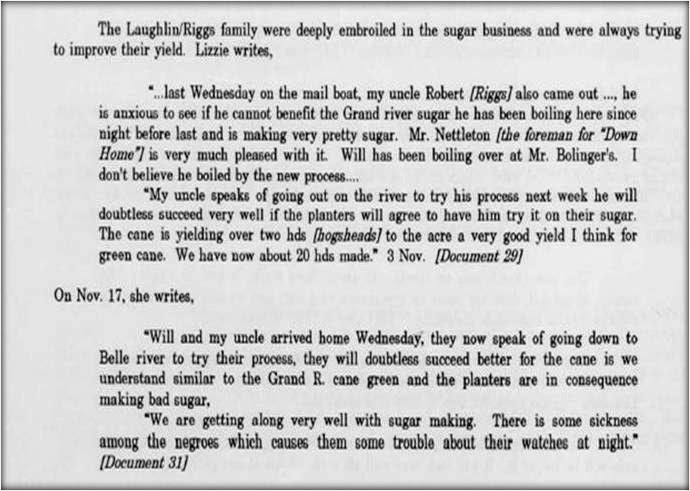 Correspondence from the Laughlin / Riggs family corroborates the Bollinger plantation. The Bollinger home was located between the former homes of C.I. and Bernice Clement and the Ernest Hedges home by verbal interviews from the folks mentioned above. Until recently we thought that finding a picture or proof of this Plantation home at Bayou Pigeon was lost to history. However, Jaime Morales, spouse of Quentin Morales, new commercial fishing family at bayou Pigeon, made me aware of video from the 1940’s That had a short clip of Bayou Pigeon. The video was done by LA. Baptist College. This video is another priceless peice of history. After reviewing the video we managed to get the following screen capture from the video. 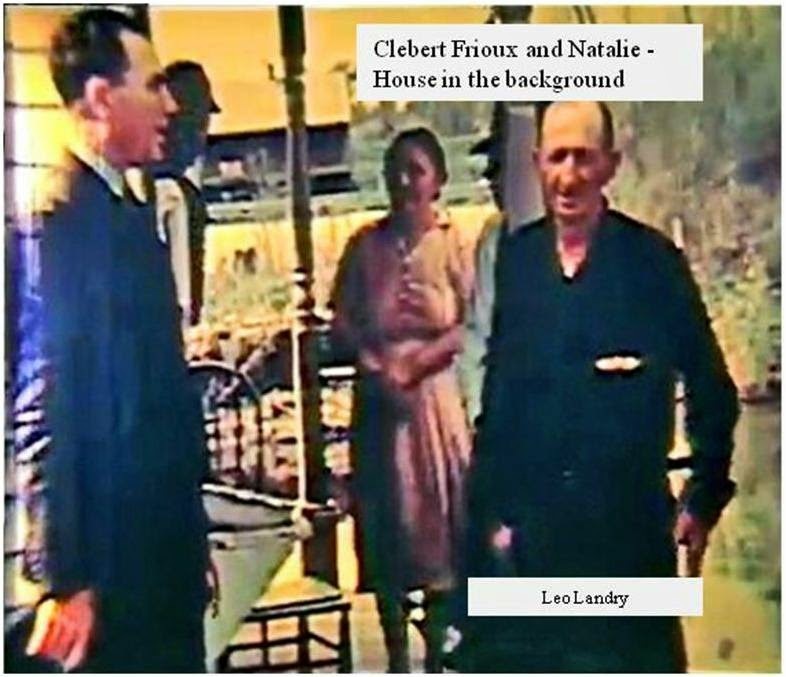 The man and woman on the right, standing on the porch of the houseboat are Leo Landry, and his first wife, Laura LeBlanc. Lo and behold, look at the picture of the house in the background. After verifying where the the Leo Landry houseboat, located in 'houseboat alley' where this picture was taken. The house in the background is on the west side of Grand River exactly where the Frioux house was said to be located ! By the grace of God we have found a picture of the Bollinger plantation house. In conclusion, you might ask why we are doing this. If we don’t document our history it will surely disappear. Nestor Michel, more than likely knew he was living in the old George Mitchelltree home, but obviously he did not pass that information down, if he did it lasted one generation at best. We will never know if Anatole Berthelot, knew the origin of the residence he purchased. We know that none of the second generation Berthelots descendants were aware. Again, the same for Clebert Frioux and his descendants. 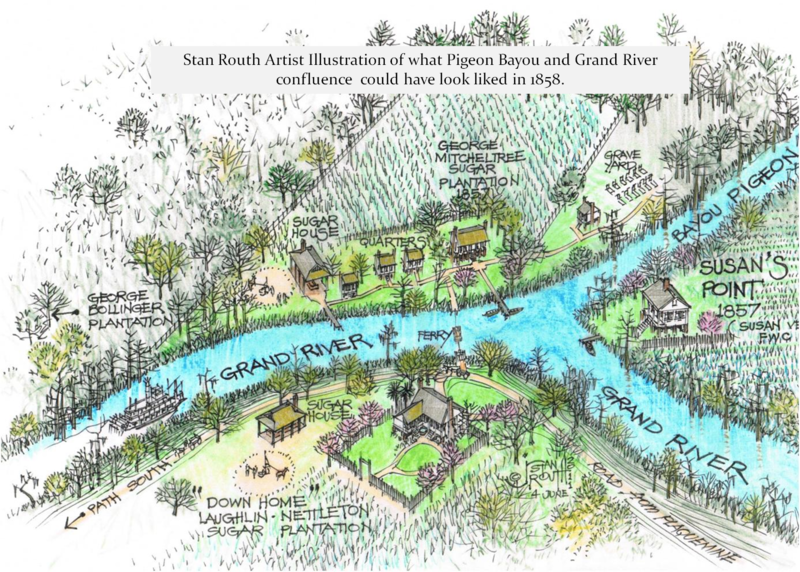 By connecting these dots of history we are ensuring / perpetuating the continuing existence of Cajun Bayou Pigeon culture. People find it interesting to know how the people / their descendants lived their day to day lives. Wise people say; “If we know where we came from, we may better understand who we are and we may better know where to go. The Ghosts of the Past Speak to All Who Will Listen"
Book Review - "Bayou Pigeon, LA. Spirit of the Atchafalaya"
Bayou Pigeon: Spirit of the Atchafalaya. By Cliff LeGrange, Adam J. Landry, Geraldine Settoon, James J. Landry, and Patricia L. Settoon. (Baton Rouge Printing, 2011, 696 pp. Introduction, foreword, Maps, photographs, sketches, timeline, bibliography, index, cloth 469.95, ISBN 978-0-615-65490-4). Bayou Pigeon is an excellent work. This book written by a committee of capable non-scholars for a popular audience, provides a wide scope exploration of one small community—Bayou Pigeon—and how the people of this community were forced to adjust over time to altering economic and environmental realities. Although centered on just this one town, the findings have broader implications and can be assumed to be relevant for other small communities in and around the Atchafalaya Basin. Lessons learned would apply to all of them. I laud the authors for their dedication to uncovering and preserving the area’s rich history and for going forwarding publishing this book. Nowadays, with the rise of electronic research tools and resources, as well as options for self-publishing, many books are produced and areas of research tackled without involvement of trained scholars. This evolution should be embraced by academics, since passionate non specialist have something to contribute. This trend cannot be stopped, and Bayou Pigeon is an excellent example of this societal movement and how it can be done successfully. It was written and printed by a dedicated group with little regard toward remuneration, and they should be commended. The book is well organized, and its themes are consistent. In a testament to the care and time invested by the authors, the first printing won a bronze medal in the IPPY Awards (the Independent Publisher Book Awards in the category of “South-Best Regional Nonfiction.” This second printing is somewhat expanded, and many of the picayunish errors of the first have been corrected, except for a few found where French words are used. Bayou Pigeon can be divided into several parts (all of which could have been books unto themselves. The first, after a short introduction, explores the area’s history (Chapters 3-8). This section includes a detailed timeline of events in French Louisiana, early settlement on ridges in the swamp, the antebellum agriculture era, the impact of the Civil War, logging floods and the beginnings of the folk economy based on the swamp. The next section (Chapters 9-15) treats more historical topics such as movement out of the swamp, development of the floodway, the impact of World War II, population growth, and Americanization of the people. The next section (Chapters 16-21) is on the developing swamp economy, but includes music and religion. The final text section (Chapters 19-34), the longest at 223 pages, is on genealogy. Finally, the last three chapters provide a photographic essay, remember those who served in the military, and discuss the origin of the name “Pigeon.” There is no conclusion that sums up the findings of the book. A flyer describes this book as “Big, Bold, Beautiful,” and that is an apt description. It weighs a little over seven pounds. Reasons for the weight are one, the very heavy, coated, and glossy paper (done in order to enhance the beauty of the illustrations, maps and photographs), and two, the length—696 pages. It is also of an unusual size, as the pages are nine by twelve inches. This allows for inordinate amount of information to be put on each page and for larger maps and illustrations. This book has several strong points, one being the many high quality maps. Many were drawn specifically for this book, but most are either older historical maps or maps from various government agencies. Another distinction of the book is the great number of colored, hand drawn illustrations of houses, places, stores, and the like. They are a delight. Relatedly, the vast number of pictures is another strong point of the book. Many are simply snapshots, but others are beautiful works of art. They all tell stories and are a delight to examine. Indeed a person could spend hours just dreamily perusing the illustrations and photos contained in this book. I firmly believe this book should be in all public libraries in South Louisiana and in University Libraries. I fear, however, that its weight and resulting cost might make it a hard sell to the general public. It would, however, make an excellent “coffee table book,” and could be sold to tourist or anyone with a sincere interest in the swamps or peoples of South Louisiana. AREAS OF SPECIALIZATION: Cajun Scholar ...Culture Diffusion and Culture Change, Historical Geography, Geography of Europe, History of Geographic Thought, Geography of Arizona and the Southwest, The French of Louisiana. Stan Routh, a person with the credibility to know, what he is talking about called it,(By the way he said this before / independent of Dr. Comeaux's review). “This is a very, very, good book written by a very, very good and knowledgeable team of authors”, Stan Routh, 2012.